Rayann Lees said if a school-operated food pantry had been open when she was younger, her family could’ve benefitted from it. Now, families can. Mt. 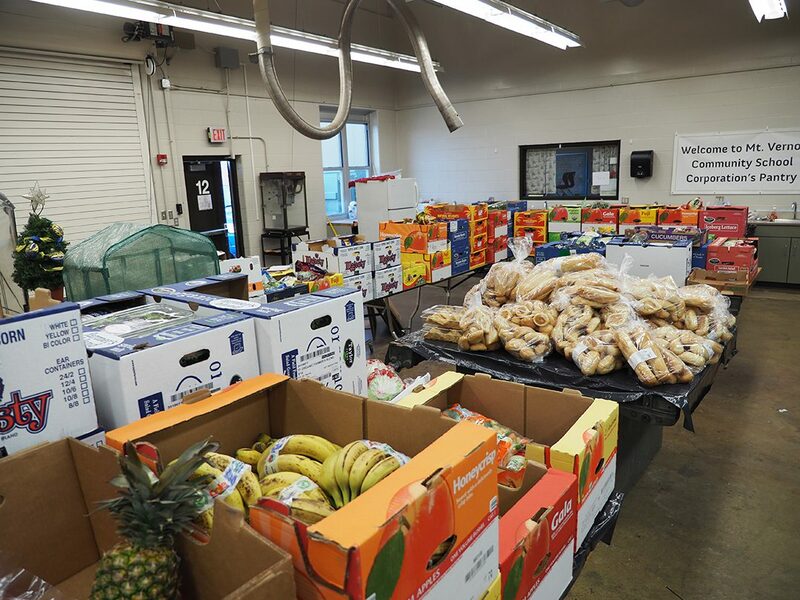 Vernon High School is one of Gleaners Food Bank’s five pilot programs to offer a school food pantry, which launched in 2014. Now, the pantry is feeding families and educating students. The pantry ensures family privacy and requires no financial proof of need. The only requirement is families must have a student enrolled in the Mt. Vernon Community Schools Corp. Previously, the pantry was open to anyone in the community. The policy was changed following arguments among attendees and personnel issues. The pantry is now only available for families of Mt. Vernon students. Gleaners Food Bank delivers fresh produce, meat and bread once a month. Other Mt. 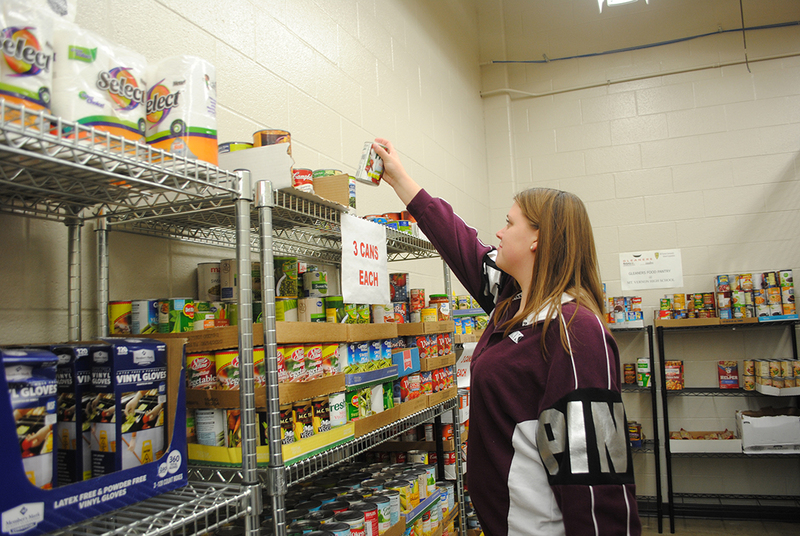 Vernon schools conduct nonperishable food drives to stock the pantry. Students in the MVHS JAG class, or Jobs for America’s Graduates, unload the delivery truck, set up tables for the food and clean up after the families visit the pantry. Students perform the work during their JAG class on school days. Each Jag student is required to work a minimum of 10 service hours a year, and the food pantry helps students fulfill the obligation. “The purpose for the service hours is for the students that don’t have a job during high school, or even if they do have a job in high school, so they can do something they can put on a resume,” JAG teacher James Cochran said. Lees regards working at the food pantry a valuable learning opportunity. Cochran is delighted to provide the pantry for those in need. The pantry is open from 4 to 5:30 p.m. Dec. 6, Jan. 10, Feb. 7, March 7, April 4 and May 2. Families must enter at the northwest corner of the school through door 12 at Mt. Vernon High School, 8112 N 200 W, Fortville. Although families collecting items from the monthly food pantry at Mt. Vernon High School are only those who have a student in the school district, Mt. Vernon High School still ensures school safety when allowing those who are not students or staff into the building. “They actually enter from a door outside and are not really in the school,” Cochran said. Another safety measure is only opening the food pantry after school hours.